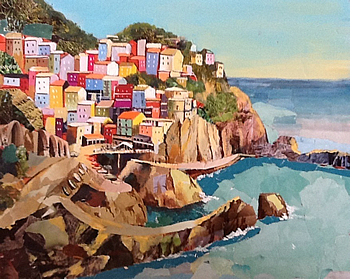 This collage is of the village of Manarola in the Cinque Terre one of our excursion venues. Making bright and colourful collages is an exciting way of producing art. 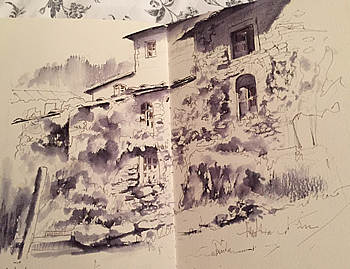 During my course we will choose a subject from the wonderful surroundings and, using shapes torn from magazines, together with painting in acrylic and watercolour, plus pen and ink drawing, together will create vibrant artefacts. This picture is a pastel painting on sandpaper, similar to 'wet and dry' emery paper. The gritty tooth of this paper makes it an ideal support for pastel paintings as it grips the pastel. However it's hard going on your fingers especially if you like to rub pastel in! 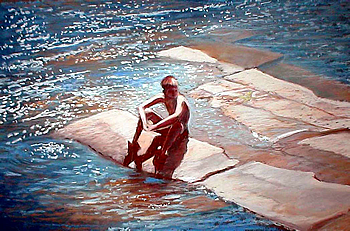 The picture came from a photograph I took whilst walking in Richmond, North Yorkshire, A group of boys were jumping off a bridge into the water and this boy was having a rest on the rock. I loved the shape of the boy and the shimmering water behind. I like to work on dark papers, using the dark as a tonal value to work against. I used a pastel pencil to draw the figure and rock shapes. Sue Ford is often inspired by the wide range of subjects on her doorstep in North Yorkshire and she has exhibited widely, both locally and nationally. She also writes for Leisure Painter and Paint! magazines. 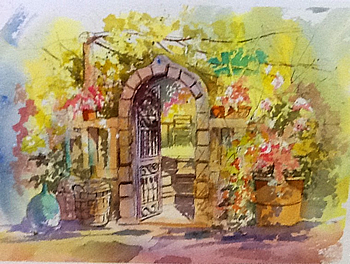 Her classes, workshops and painting holidays, both in the UK and abroad, are very popular, not least because she is skilled in a large number of media and can give practical advice about materials and techniques, as well as more general tuition in composition, colour and so on. As a teacher she wants to inspire and encourage her students to achieve their artistic goals and realise their creative ideas. She says: "The aim is to stretch all students regardless of ability, and with patient, professional tuition, to form a foundation of artistic techniques as well as developing their own style in a relaxed learning environment."